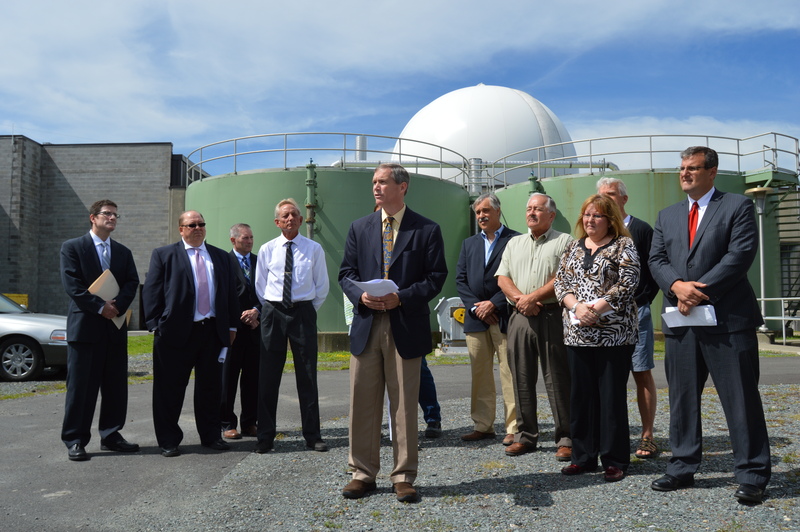 Martin Reid, Chair of the Rensselaer County Legislature, is joined by members of the Albany Pool Communities and partners to highlight recent improvements to the Rensselaer County Sewer District’s disinfection system which will improve water quality in the Hudson River. The Capital District Regional Planning Commission has taken the lead in organizing a consortium to develop a comprehensive inter-municipal Phase I Long-Term Control Plan (LTCP) for Combined Sewer Overflows (CSO: overflows from combined storm & sanitary sewers) discharging into the Hudson River Estuary. The participating Albany Pool communities are the Albany Water Board; the cities of Cohoes, Rensselaer, Troy and Watervliet; and the Village of Green Island. Each community currently has its own State Pollutant Discharge Elimination System (SPDES) permit. 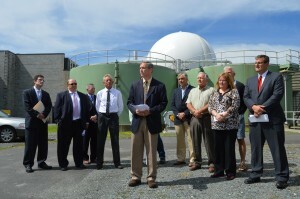 The Albany & Rensselaer County Sewer Districts are also partners in the consortium. Check out the Albany Pool Communities CSO LTCP Brochure Scroll down for status updates and reports. Albany Pool CSO Long Term Control Plan – This page provides information on the Long Term Control Plan to significantly reduce the direct discharge of stormwater diluted with sewage in the Hudson River. The Albany Pool of the Hudson River currently has 92 Combined Sewer Overflow points. 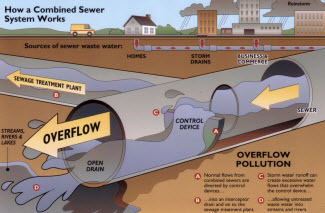 Combined sewer systems are designed to discharge directly to surface bodies of water such as rivers, estuaries, and coastal waters during wet weather when total flows exceed the capacity of the combined sewer system or the treatment plant. In 2007, the Pool Communities began working together to develop a joint Long Term Control Plan. The plan was created to study the current health of the Hudson River, identify programs and projects that will aid in the clean-up of the river, and through a sophisticated modeling system and post construction testing program, and demonstrate the effectiveness of the program. Working with the Department of Environmental Conservation, the Pool will implement more than 50 projects and programs that will significantly improve the water quality of the Hudson River and its tributaries. Implementation of the Albany Pool Communities’ LTCP is already underway. The communities have developed and executed the intermunicipal agreement that will guide the shared implementation of programs and projects. The communities have also established a Local Development Corporation that will take on the role of administrator. As the program is implemented, further sampling and analysis of the Hudson River and its tributaries will take place, allowing the Albany Pool Communities to measure the ongoing success of the program. Each year the Pool Communities submit two semi-annual reports to NYSDEC. These reports communicate to the Department the progress of the LTCP program and provide a narrative on particular aspects of the Program as requested by the DEC.
*Online versions of these reports contain summaries of the post construction monitoring programs in order to accommodate file size limits. Several hundred pages of items such as individual daily sampling results and lab chain of custody receipts have been omitted but are available upon request. The Albany Pool Communities have jointly developed this web-based information service that provides easy access to alerts for potential for CSO activity in the Capital region. Visit the website at www.albanypool.org. Note: The Combined Sewer Overflow (CSO) Notification System is not currently supported by Firefox. The IMA Board (below) is responsible for ensuring continued compliance with the Order on Consent and terms of the 2015 Albany Pool Communities IMA executed by each of the Pool Community Members. The IMA Board meets the offices of the Capital District Regional Planning Commission, One Park Pl. Albany NY 12205. All meetings of the IMA Board will held at 9am unless noted otherwise. The Albany CSO Pool Communities Corporation was established to provide a mechanism to jointly manage the development and implementation of LTCP projects, oversight of program consultants and administrators, and reconcile program the finances. The Albany CSO Pool Communities Corporation Board meets the offices of the Capital District Regional Planning Commission, One Park Pl. Albany NY 12205. All meetings of the Corporation’s Board will held at 10am unless noted otherwise. Budgets, minutes of Corporation meetings, and all corporation policies and are posted on the Corporation Page. In addition to several demonstration projects, the Albany Pool CSO LTCP supports the implementation of several Green Infrastructure (GI) strategies. 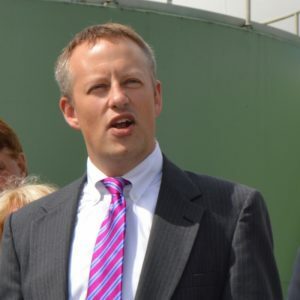 The APCs have implemented a robust Green Infrastructure Program which has evaluated the effectiveness of “green practices” through codes and local law review and performed a feasibility assessment for a “Green Infrastructure Banking System”; and the implementation of additional demonstration projects. Development of a pool-wide Green Infrastructure Tool Box is underway. The Communities have committed to document and report new public and private development projects within the APCs to the Department in an annual report.